Model Workboat 6.0 powered by a powerful engine to get great value of shooting - the lightweight. Normally it used in the Pacific Ocean to take objects and counteract the effect of currents. ... will primarily perform tasks such as waterway police surveillance duties, construction inspection, maintenance and service works on floating or fixed navigational marks, pulling and pushing of barges and floating equipment, etc. 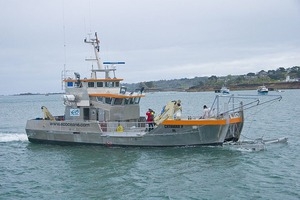 A work boat is one of a vast family of professional craft less than 25 meters in length designed for service, support, logistical and other tasks at sea. These craft can be multipurpose or used for a specific type of operation. They include pollution clean-up vessels, dredges for shoreline maintenance and barges for cargo transport. Construction varies with operational needs, configurations ranging from rigid inflatables to barges. Metal hulls are more common than in recreational craft to withstand possible collisions during work at sea. Practicality is favored over comfort.